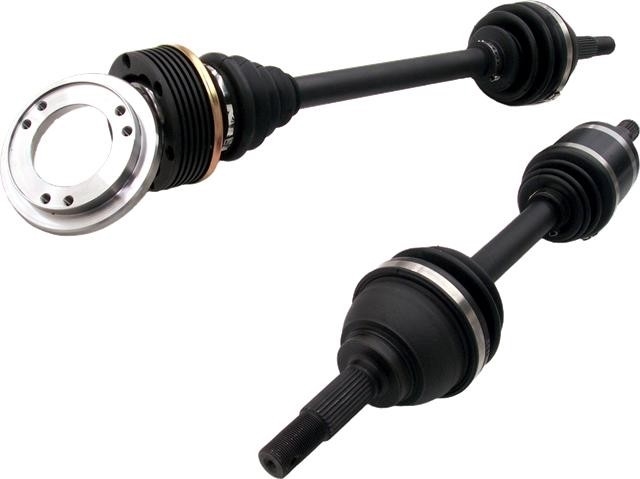 The Level 5 complete front axles for the GT-R. The axle center bar (the weakest link on the factory front axles) has been upgraded from the small stock 27 spline to larger 36 spline bars made from high quality aerospace grade material. These axles feature a direct fit outer CV made from a proprietary material, billet inner CV and spline plug into the differential on the male side and a Porsche-style 108mm inner with precision machined adapter plate to mount to the drive flange on the opposite side. Capable of 1000HP and can be used for street or drag with no modifications required. Level 5 complete front axles for the GT-R.